Bangladesh will have more to prove than Zimbabwe when the two teams clash in an inconsequential Champions Trophy qualifying match here tomorrow. The BCCI’s claims of enhanced “professionalism” under the leadership of Sharad Pawar were exposed today when Kapil Dev admitted he had no idea about his role as the new chairman of the National Cricket Academy. Indian hockey teams, both men and women, will have to win at least a silver medal each in the 2006 Asian games to be held in Doha in December this year to gain direct entry to the Beijing Olympic Games. Saddled by a string of poor performances, the Indian Hockey Federation might consider appointing a foreign coach again after the Asian Games in Doha in December. The International Weightlifting Federation (IWF) has decided to waive off the suspension on Indian federation, serving a one-year ban for doping misconduct, in lieu of a fine allowing its athletes to get back into action at the upcoming Asian Games. “Catch them young” is former coach Pal Singh Sandhu’s advice to the Indian Weightlifting Federation. He doesn’t mean promising players, but dope cheats. Doping culture proliferates at the junior club level itself, he says. The dope trial leads from senior players to juniors. Eighth-seeded Sanam K. Singh of Chandigarh warded off a determined fight by third seed Vivek Shokeen of Delhi to win at 7-6, 4-6, 6-4 and sailed into the men’s singles semifinal of the DSCL Open National Tennis Championship at the Delhi Lawn Tennis Association deco-turf court here today. Swede Joachim Johansson made a stunning return to top tennis after a year of injury, hammering home a 6-4, 7-6 (7/4) upset win over Rafael Nadal in a Stockholm Open shock. Jeev Milkha Singh fired a brilliant six-under 65 to take a two-shot lead after the opening round of the Japan Open here today. Both the sides are out of the reckoning following two defeats each in as many matches, against Sri Lanka and the West Indies who have clinched the two spots available in the Super Eight stage. That is very much in keeping with the script but last night’s defeat against the Caribbeans must have hurt the Asian team more than the two maulings the African minnows have suffered in the biennial event. Zimbabwe were handed a nine-wicket thrashing after being bundled out for 85 by title holders West Indies and then Sri Lanka pasted them to register a 144-run victory. Nothing more could have been expected of a team that has been stripped of its Test status and comprises a bunch of raw youngsters whose average age is 21. Bangladesh, on the other hand, have consistently flattered to deceive. They started the tournament with a reasonable performance against the Lankans in the first tie at Mohali where they held themselves while chasing a tall target of 304. But the batting crumbled when asked to set a target against the West Indies, crashing to their 113th loss in 135 matches. Brian Lara’s men were going to give them no quarter, themselves having a point or two prove after being forced to come through the qualifying rounds despite being the defending champions. The 10-wicket loss was a massive dent in their pride and a big let down on the expectations following a few good wins in recent times. Captain Habibul Bashar, who has failed to score a run and has lasted only three balls at the crease from the two innings he has played so far, said it was a “bad game” and did not expect it to be repeated again. Bashar would also remember the recent one-day series loss to Zimbabwe. With voices against their Test status always growing, Bashar’s men need to come up with a big win to silence their critics and fans. Kapil, who replaced Sunil Gavaskar at a recent BCCI AGM, said none of the BCCI officials had apprised him of his responsibilities. “I was told that I have been appointed NCA chairman, but I don’t know what I am expected to do,” the World Cup-winning captain said. The former all rounder said he was not fully aware of the NCA’s duties according to the BCCI rules. “We will have to wait till the first meeting of the NCA members to decide what we will do,” Kapil said. The NCA is responsible for grooming young talented cricketers with an aim to prepare them for the highest level of the game. The other members of the NCA Board are Ajay Shirke (vice chairman), Shivlal Yadav (Director), Lalchand Rajput (Director-coaching), Ashok Bhagwat, Sunil Dev, Samar Pal and four of the BCCI office bearers. Kapil, however, expressed happiness that he would get an opportunity to contribute to the game in his new capacity. “It is good that I have been considered good enough to take this responsibility. “I am a field man and not a commentator or writer like many other former players. I will try to do justice to my new role,” he added. Former captain Kapil Dev today expressed his disapproval of the policy of continuous experimentation with the composition and strategies of the Indian team, saying Indian players performed better when their place in the side was secure. “Indians are not very comfortable with uncertainty. They need to be sure of their spot in the team to instill confidence in them,” the World Cup-winning captain said. He attributed this factor to the culture and the general upbringing provided in the country. “We need our base to be strong. We are brought up that way. Even in other walks of life, Indians were not very amenable to change,” Kapil said. “We don’t change our bases readily for better jobs and higher salary. We want to stay close to home,” he said. Indians think differently than Americans, Australians and Europeans, Kapil claimed. India coach Greg Chappell and skipper Rahul Dravid have employed frequent changes to team composition and batting order testing out players in different roles, but Kapil disagreed with the approach. “The experiments employed have to be consistent with the culture of the concerned players, their mindset and environment to be effective,” he stressed. According to the qualification criteria released by the International Hockey Federation today, teams which do not finish with a gold medal in the continental championships to be held between December this year and September next year will either gain direct entry on the basis of three extra quotas being allotted in case of men’s and womens’ sections each or they will have to win the Qualifying Tournament to be organised in the first half of 2008. The qualification system for the 2008 Olympic Games men’s hockey tournament makes the hosts China and champions of the African Olympic qualification tournament,15th Pan-American Games,15th Asian Games, 11th Men’s EuroHockey Nations Championship and the 5th Oceania Cup. For the men’s competition, the three extra quotas include two for Europe. The runner-up and bronze medalist of the 11th European Nations Championship will also qualify directly for the 2008 Olympics Games. The third extra quota goes to Asia. The next highest placed team (other than the Asian Champion and China) at the 15th Asian Games will also qualify directly for the 2008 Olympics Games. This will give India an extra chance of getting direct entry. However, if China wins the final of the 15th Asian Games, a fourth extra quota becomes available, and, based upon the Sahara World Hockey team rankings, this will be allocated to Asia. In this event, together with China, the silver and bronze medalist of the 15th Asian Games will also directly qualify for the 2008 Olympics. The last three spots for the 2008 Olympic Games men’s hockey will be determined by the Olympic Qualification tournaments in 2008. The exact locations and dates of these events will be decided mid November this year. Similarly for the 2008 Olympic Games women’s hockey competition, besides hosts China, champions of the African Olympic Qualification Tournament, 15th Pan American Games, 15th Asian Games, 8th Women’s EuroHockey Nations Championship and the 5th Oceania Cup. In addition, based upon the Sahara World Hockey team rankings, of three extra quotas allocated to different continents for direct qualification, two go to Europe. As such the runner-up and bronze medalist of the 10th Women’s European Nations Championship also qualify directly for the 2008 Olympics Games. The third extra quota goes to Asia. It means that the team placed next to the champion and the hosts China also qualifies directly for the 2008 Olympic Games. However, if China wins the final of the 15th Asian Games, a fourth extra quota becomes available and, based upon the Sahara World Hockey team rankings, this will be allocated to Oceania. In that case the runner-up of the 5th Oceania Cup will qualify directly for the 2008 Olympic Games. The last three spots for the women’s hockey competition will be determined during three Olympic Qualification tournaments. One of these tournaments will take place in Vancouver, Canada. The exact dates and locations of the other two qualification events will be decided in middle of next month. IHF President K.P.S. Gill said they will look at the possibility after assessing the team’s performance in the Games. Asked whether the IHF would go for a foreign coach, especially in the backdrop of the poor showing of the Indian team at the World Cup in Germany, Gill said the Federation would make a decision after assessing the national side’s performance at the 15th Asian Games. “It will depend on the Asian Games,” the IHF supremo said at a press conference held here to announce the dates of the 62nd Senior National Championship. IHF has not had a happy experience with the only foreign coach they appointed a couple of years. Germany’s Gerhard Rach quit his post in a huff but not before launching a verbal tirade against the IHF bosses. Gill, for a change, did not sound very enthusiastic about the national team’s chances in the Asian Games. “It’s very difficult to say. Because some top teams like Pakistan and Korea will be there. Besides, an emerging side like Japan, who finished above us at the World Cup at ninth spot, will also be there,” said Gill. The IHF chief said the Indian team would focus on their techniques after the Asian Games. Gill unveiled the logo of the Senior Nationals, to be sponsored for five years by the Dainik Bhaskar newspaper, on the occasion. The Nationals will be held in three phases. In the first phase, 37 affiliated state units, divided into eight groups, will play league matches and two teams from each group will qualify for the knockout stage. These 16 teams will play knock-out matches and eight will qualify for the super league. In the second phase, 14 associate members, divided into four groups, will play league matches in Delhi from October 20. One side from each group will qualify to take part in the super league. The IWF has informed the Indian Weightlifting Federation that their weightlifters would be free to take part in any international event once they pay the fine amounting to $50,000. “The Indian Weightlifting Federation shall pay the fine of $50,000 and remain suspended from the membership of the IWF only until the whole amount of the fine is duly paid to the IWF,” the IWF said in a letter to the Indian body. The IWF also declared that the money procured would be utilised for the purpose of anti-doping activities. “The IWF Executive Board declares that the fine shall be used for the purpose of anti-doping activities,” it said in the letter. The national Federation was suspended for 12 months till March next year after India’s Edwin Raju and Tejinder Singh tested positive for a banned steroid at the Melbourne Commonwealth Games early this year. Shailaja Pujari and B Prameelavalli were the other two who returned positive tests in the pre-event doping tests conducted by WADA officials at the national camp in Patiala. Four positive cases in a calendar year were more than enough for the IWF to ban the Indian federation for a second time within seven months of coming out of a previous ban following the Athens Olympic doping fiasco. The decision apparently came after the IWF realised that several countries, including Iran, Kazakhstan, Russia and Argentina were at present serving their suspension period and would not be able to take part in the Doha Asian Games to be held in December. Since the wrongdoing of few weightlifters was affecting the young and innocent lifters, most of these countries, who do not have problem with the funds, would be willing to pay and become active at the earliest. As far as the Indian case is concerned, there was dim hope for their athletes due to lack of adequate financial resources. “We are looking at it (paying fine) if we can arrange some funds. We have money but that won’t be enough and pooling in money is not easy. We have not yet initiated any talks in this regard so far,” national federation president H.J. Dora told PTI. “We will try our best, otherwise it would be like killing the prospects of the beginners,” he said. Also, the lack of preparation of the Indians in the absence of any scheduled training camp would make picking the right candidates for the competition in a short span a difficult proposition. “Catch them young” is former coach Pal Singh Sandhu’s advice to the Indian Weightlifting Federation. He doesn’t mean promising players, but dope cheats. Doping culture proliferates at the junior club level itself, he says. Sandhu, the Dronacharya awardee coach, who had been associated with national teams for more than 20 years, wants the federation and other bodies concerned to start dope tests at the club level itself. That is the level where the lifters start taking steroids and other performance-enhancing substances. Indian weightlifters are reeling under a one-year ban for the second time within seven months. For the ignominy he rests the blame squarely on the players and exonerates the federation and the coaches completely. “It is not federation’s fault.” But the federation goes into denial every time a positive test is revealed. Huge holes can be punched into coach Sandhu’s advice and statements. Sanamacha Chanu and Pratima Kumari, who failed tests at the Athens Olympic Games and Edwin Raju and Tejinder Singh, who tested positive at the Melbourne Commonwealth Games, had cleared tests conducted by the Sports Authority of India’s Dope Control Centre. And somehow, the idea that the coaches have no knowledge of their trainees using dope does not cut ice with sports followers. If coaches don’t have inkling of players’ performance and its components, then Indian weightlifting is in dire straits. In a battle of the baseliners, Sanam clinched the match with his staying power and better court craft as he covered the length and breadth of the court to executive some breath-taking winners to keep his opponent on tenterhooks. But the best match of the championship was fought between two young players, Vishnu Vardhan of Andhra Pradesh and Arjun Goutham of Karnataka, and the former won the engrossing duel after a stamina-sapping three hours and five minutes at 6-2, 6-7 (4), 7-5. Vishnu, a semifinalist in the grass court nationals last year, could have wrapped up the match in straight sets, but after winning the first set comfortably and leading 5-4 in the second, he committed some unforced efforts to concede the advantage which was seized by Arjun to take the battle to tie-breaker in which he prevailed with some searing winners. In the decider, both players held their serves till 5-5, but then Vishnu achieved the vital break to wrap up the set and the match. Vishnu, a product of the AITA coaching scheme, has shown the potential to be a player to be taken serious note of as he has an amazing all-round game with a whipping backhand. Last year’s runner-up Ashutosh Singh made a mockery of the seeding as he knocked out second-seeded Aditya Madekar in straight sets at 6-2, 6-1. Thus the top two seeds are out of the semifinals as earlier, top seed Divij Sharan pulled out of his semi-final clash against Purav Raja, citing a shoulder injury as the reason. In the women’s singles, top seed Isha Lakhani did not have to strain much to overwhelm sixth seed Parija Maloo 6-3, 6-4 in an all-Maharashtra quarterfinal. However, Maloo had the consolation of making the girls under-18 semi-final when she defeated Nupur Kaul 6-1, 6-2. Second-seeded Sandhya Nagaraj also posted a straight-set victory when she powered past Shalini Sahoo of Delhi 6-4, 6-2. Delhi schoolgirl Vishka Sheoran continued to make waves as she booked her berth in the semifinal after beating Sweta K Solanki, also of Delhi, at 6-0, 6-3. But she had little stamina left to wage another full-blooded battle in the girls under-18 singles quarterfinal and lost to Kyra Shroff at 5-7, 1-6. In the other woman’s singles quarterfinal, fourth-seeded Sonal Phadke had to dip into her reserve energy to dispose of a tenacious and fighting Kelsey Sunderam of Tamilnadu at 7-6 (7), 6-4. Madura Ranganathan progressed in the girls under-18 singles when she edged out her Tamil Nadu State-mate Shmita Eashwaramurthy 6-1, 7-5. With some exciting new faces making the last four grade in both the men’s and women’s singles, the penultimate day’s matches are expected to provide lots of thrills. 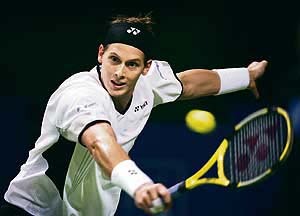 The 24-year-old “Jackhammer”, his ranking languishing at 690 after shoulder surgery in summer, 2005, and subsequent elbow problems, rained down 17 aces against the Spanish world No. 2, following up his bombs with charging attacks on the net yesterday. He reached his first quarterfinal since Marseille in February of last year. The 34-year-old Indian star, who returned here after a week’s holiday in Chandigarh, seemed fresh and relaxed as he pushed Japanese superstar and Order of Merit leader Shingo Katayama to the second place at the Kasumigaseki Country Club West Course. Jeev, who is having his finest year in the circuit, had a dream start in the flagship event of the Japanese tour with two birdies on the first two holes and a third on par-5 sixth to turn in three-under needing just 13 putts for the first stretch. On the back nine, he opened with another birdie on par-5 tenth but then dropped his only bogey of the day on 11th. But from 14th to 16th, he had a hat-trick of birdies and finished the day at six-under.